“You will never change your life until you change something you do daily. The secret to your success is found in your daily routine”. So says John Maxwell. This is fine in a general sense, but does it apply to your business as well? Your business and your personal life are two different things, however, there is one thing that they both have in common – you. The way you treat yourself – your daily routine – will definitely have an effect on your business. Is your business about to take a nosedive? Are there issues in your startup you cannot seem to resolve? As you spend time evaluating all your employees and business processes, never dismiss the fact that the problem might just be the man in the mirror (sounds harsh but it is true). This was the first daily routine I had to improve on. Yes, I used to be perpetually guilty of this one. I was an avid fan of grey’s anatomy (I still am) and I would stay up late on many occasions to catch the latest episode of the season. I soon noticed that this addiction was cutting into my work time and reducing my productivity. Therefore, I decided to improve my situation by going to bed at 8.30pm (two hours earlier than was the norm for me). On the first day, it was very difficult, but it got easier as the days rolled by. A week passed and I began to believe that I was done with late nights – and then I heard a new episode of grey’s anatomy was out. Long story short, I relapsed. This struggle continued for almost a year but I kept at it because I knew what it would mean for my business. You can start to improve the productivity of your business by simply going to bed early. Use an alarm clock as extra insurance to make sure you do wake up on time. When you go to bed early, you wake up early. When you wake up early, you get to the office early. When you get to the office early, you get more things done than if you had arrived late (you see how simple it is, don’t you?). The body is like a machine; leave it unused for too long and it will slowly but surely rut away. Regular exercise keeps your mind and body alert. 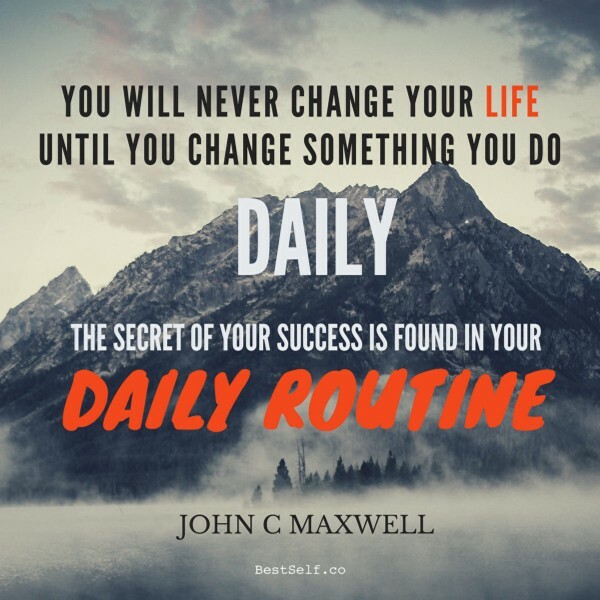 This is definitely a part of the daily routine for success practiced by successful business owners. Exercise is especially helpful if your work requires a lot of moving around. You will feel drained too often at work if you are not in the habit of exercising your body. Get in some exercise every morning before you go to the office. If for some reason, you cannot do so in the morning, do it in the evening. The benefits are too numerous to ignore. You can also do little things at the office to help you keep fit. For instance, you can take the stairs occasionally in lieu of the elevator. However, do not get carried away and overexert yourself. You are not training for a marathon. You are the owner of your startup and as such are ultimately responsible for its success or demise. However, this does not mean you should keep working until you burn out. Your business will stall if you are dead. Schedule your work and break it into reasonably smaller bits then tackle them one after the other. Whenever you finish any block of work – or two (depending on the magnitude of the task), take a break to clear your head. This gives you time to recharge – mentally and physically. This way there is a lesser chance of you leaving some work incomplete at the end of office hours or worse still, carrying too much workload home with you. A common saying goes, ‘readers are leaders’. Well, so are successful business owners (who are also leaders in their own right). One of the best ways you can invest in self-development is by reading. Constantly devoting yourself to reading will increase the versatility and wealth of your knowledge base. This makes you more compatible with varying life situations that would otherwise seem foreign to you. It will be almost impossible for you to find yourself in the middle of a conversation that you cannot contribute towards. Entrepreneurs with this attitude do well in their businesses because they have built a formidable mental capacity to deal with every possible work situation. They are very research capable and always keep abreast of the latest trends in their industry. This reduces the probability of them being uninformed about issues concerning their business and consequently gives them greater control over their business. Keeping a mental note of things you have to do the next day is a terrible way to plan. A short pencil is better than a long memory. Successful entrepreneurs have learnt to plan their tomorrow – on paper – every night before they go to bed. However, it is not enough to write down the things you will do and put little check boxes beside them. Look at the list and reshuffle the items based on priority. Put the important things high on the list and the less important items below. This way even if you could not get everything done, chances are that all that is left is the stuff that is not important. This eliminates the time you spend being indecisive at work, consequently increasing your productivity. Your startup will definitely be better off if it has a leader at the helm that knows exactly what he/she is doing. The thing about clutter is that we hardly see it as a problem, until it becomes too obvious. If you are being honest with yourself, you will realize that not everything you have addresses a need. A lot is just baggage you have acquired over time. Developing the habit of regularly clearing out the junk in your life helps improve your focus because all that is left is the important stuff. Many entrepreneurs have saved their businesses by applying this principle. However, many more businesses have gone under because they let the clutter engulf them. Getting rid of clutter is an essential condition for your startups’ success. For some businesses, it could be getting rid of redundant business processes. For others it could be as simple as emptying their email inbox at the end of every day. Either way, it is obvious that constant de-cluttering helps businesses succeed.